This ship log goes back in time, with newest entries at the top. We cover the Save the Delta Queen Campaign, general steamboat news, steamboat ancestry, paddlewheel boats wanted or for sale, and model boats; and anything to do with river or boat history. To search this section or the whole site, go to Steamboat Blog Archive. Steamboats.com has been online since 1998 and our blog archive goes back to 1998. Click here to see the oldest posts. I am still trying not to let myself get too excited yet. It is just so nice to finally see some light at the end of the tunnel after all of this time and work we all have done over the years trying to get this to happen. I think it will make it through Senate all right I hope, but I am not going to rest until this bill is signed. Then I will be one happy boy. Let's keep our fingers and toes crossed still. Then after all of this is done. Hopefully Xanterra does the right thing and lets "DQSC, Inc." purchase it. Steamboats.com editors add: YEAH! Everyone who wants to see this work, cross your fingers, toes, and eyes, and stay like that until the bill hits the President's desk, and the reigns go to DQSC. This afternoon the U.S. House of Representatives voted overwhelmingly to save the Delta Queen. 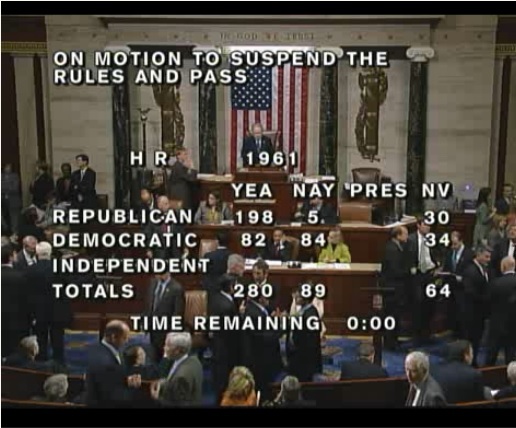 Here is a screen shot of the final vote, sent in by Delta Queen advocate Jim Whetzel. Now it is up to the Senate to pass the identical bill, then Xanterra needs to turn her over to the care of the people who understand and love her. Media coverage: maritimematters.com, bubblews.com, topix.com, theintelligencer.net, dispatch.com, mariettatimes.com, natchezdemocrat.com, communitypress.cincinnati.com [podcast], cruisecritic.com, cincinnati.com, timesfreepress.com, arkansasnews.com, Youtube.com, Railway Preservation News, floridatoday.com, wsmv.com, myworldnews.com, cincinnati.com, cruisemates.com article by Paul Motter. 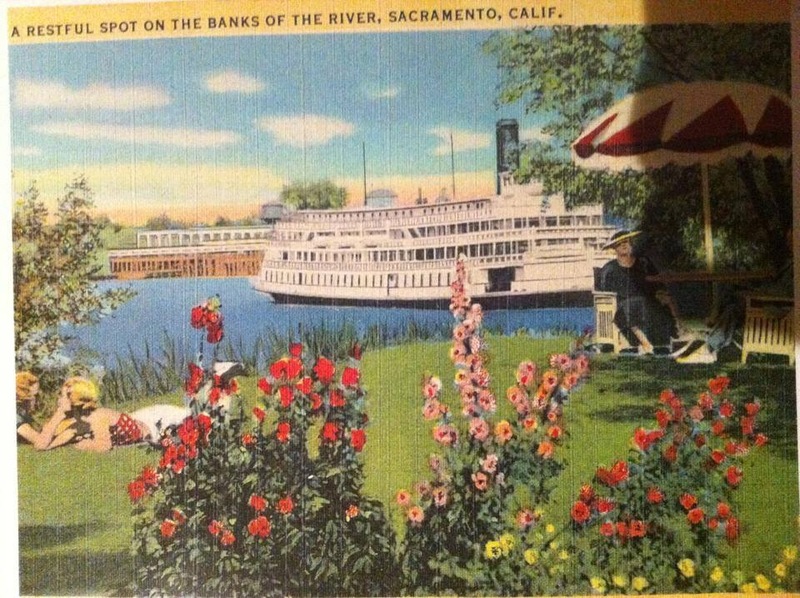 Someone sent this purdy poster of the Delta Queen in Sacramento, enjoy! The U.S. House of Representatives is scheduled to vote to save the Delta Queen on Wednesday, Sept. 25! House Bill 1961 is on the Suspension Calendar, which means that debate will be limited to forty minutes and it needs a two-thirds majority to pass. IT IS TIME TO CALL YOUR U.S. REPRESENTATIVE! Make the call today (202) 224-3121. Have your Representative's name handy so the switchboard operator can connect you immediately. Click here to find your Representative. Hi, Shane Bernard here. You kindly helped me with a steamboat question a few months ago. In the early to mid-20th century the last riverboats in my part of Louisiana seemed to be diesel-powered. Once local historian thus claims these riverboats were not "steamboats" because they didn't actually use steam. But isn't it possible that diesel fuel could be used to produce steam, just as coal or wood could be used to produce steam? In other words, did diesel-powered riverboats by definition or design not use steam to turn their paddle wheels? People are discussing moving the Delta Queen to a new location. This could also be seen as the City of Chattanooga evicting, or strongly encouraging the boat to leave. We thank the City of Chattanooga, the managers, volunteers, and people who have sheltered the boat and taken care of her the last five years. Now it is time for Xanterra and the attorneys handling the transaction to pass the boat along to the river people who can understand her and assist her in her plight. timesfreepress.com, newschannel9.com-DQ granted 6 month extension in city, timesfreepress, timesfreepress, wrcbtv.com, wdef.com, chattanoogan.com editorial, sfgate.com (sanfranciscochronicle), nooga.com, chattanoogan.com, wrcbtv.com, wdef.com, timesfreepress.com, wsmv.com, topix.com, chattanoogan.com, timesfreepress.com, timesfreepress-facebook.com. Call your U.S. Representative and two U.S. Senators and tell them it is time to save the Delta Queen! H.R. 1961 was introduced May 14, 2013, confirmed by the House Transportation and Infrastructure Committee July 18, and is expected to go up for a vote in September. Rep. Steve Chabot (R-OH) and Rep. Wm. Lacy Clay (D-MO) introduced the bill and it has twenty-two cosponsors. To amend title 46, United States Code, to extend the exemption from the fire-retardant materials construction requirement for vessels operating within the Boundary Line. Click here to find your U.S. Representative. S. 1022 was introduced May 22, 2013 by Senators Sherrod Brown (D-OH) and Rob Portman (R-OH). Senators Mary Landrieu (D-LA) and David Vitter (R-LA) joined them. Click here to find your two U.S. Senators (top right search window). When calling your elected officials, be sure to state the bill number (House: 1961; Senate: 1022), and point out that the issue is bi-partisan. Both bills were introduced by Republicans and Democrats. Plus, what American does not want to go on the Mississippi River a Mark Twain paddle wheeler? We have an opportunity to preserve this unique experience for future generations. The Delta Queen Steamboat is an authentic piece of a bygone era, a well-built machine that needs to return to the cruise industry. The Delta Queen also provides jobs and contributes to the economy in the river towns it visits, from Minnesota to Pennsylvania to Missouri and Louisiana. The National Trust for Historic Preservation, the American Maritime Officers, and the Seafarers International Union support the Delta Queen, and you can show your support today. Call your Representative and two Senators! We sadly report the passing of Captain Harold E. Howe, a captain and pilot for the Delta Queen Steamboat Company. His obituary in the Paducah Sun. The grandson of Albert S. Kelley is seeking information. So far we have learned that Cap'n Kelley was one of the last licensed Falls Pilots on the Ohio River, and that he was captain on the Delta Queen at one time. Anyone with information or a photo of Cap'n Kelley on the Delta Queen, please contact us and we will pass the information along. I have orignal Ralph Law watercolor steamboat paintings, which I would like to sell. They were purchased prior to his death and have been in my family since. If this of interest to you, know someone or know of a venue for his paintings - I will send pics and all info promptly. Editor's Note: If you are a museum or collector interested in this painting, please contact Steamboats.com. Click here for contact info. Dimensions: frame 40"x 29"; picture 29"x17"
The Dave Thomson Wing of the Online Steamboats.com Museum has thirty-eight new items for June and July 2013. The collections include illustrations, movie stills, photos of old boats, and other treasures. To see the entire Dave Thomson collection, click here. Click on June and July 2013 to see the newest items. Studying steamboat materials has proven therapeutic effects, so we especially invite anyone who is down in the dumps and in need of a dose of stimulating nostalgia to cheer 'em up. Thanks, Dave, for your generosity in sharing these great finds. The two sister ships Delta Queen and American Queen are making news this month. I have a collection of Delta Queen news below, so this will be an American Queen news wrap-up. The American Queen Steamboat Company also completed a technology update, adding a new-fangled satellite ball to the American Queen's roof that will make the wireless faster and more reliable. They also added more TV stations. You may scoff at the need for wireless on a paddlewheel steamboat, but all the better for blogging the cruise! In other news, the American Queen Steamboat Company has partnered with the National Trust for Historic Preservation, donating $5 for each cruise they book. Passengers have the option of matching the donation. For the full story, see preservationnation.org. There is a new bill in the U.S. House of Representatives to Save the Delta Queen Steamboat: H.R. 1961. Without the nod from Congress, the Delta Queen could be lost. Functioning as a hotel will not cut it. She needs the freedom to operate in the American cruise industry, and H.R. 1961 will restore her rights! All Americans will benefit if this vessel gets her exemption, since she is a national treasure that belongs to all of us—Democrat, Republican, and Independent; North, South, East, and West. Ask your U.S. Representative to support H.R. 1961. Make the call today (202) 224-3121. Have your Representative's name handy so the switchboard operator can connect you immediately. Click here to find your Representative. H.R.1961 - To amend title 46, United States Code, to extend the exemption from the fire-retardant materials construction requirement for vessels operating within the Boundary Line. Good Riddance To The Delta Queen - And Response (3) The Chattanoogan, Monday, May 13, 2013. This one is really sad, sad, sad. How did things get this bad?